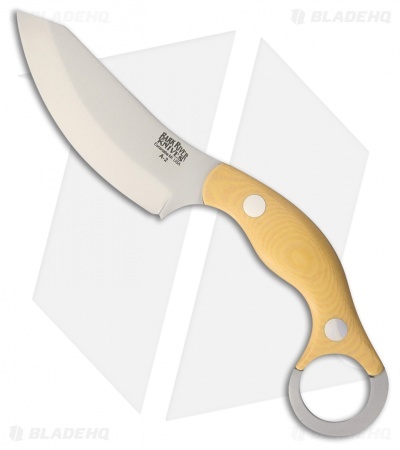 The Bark River JX4 Bush Bat fixed blade knife with antique ivory micarta handle and A2 tool steel wharncliffe blade is sure to be a popular addition to any kit or collection. A collaborative design with custom knife maker Shane Wink, outdoor expert Chris Tanner and Mike Stewart, the result of a karambit meeting a skinning knife is an interesting and functional tool with surprising capabilities. The sweeping wharncliffe blade is fantastic for skinning with it's long belly but is able to do any light to medium tasks. Fire or food prep, game processing even carving is a breeze with the convex edge scandi grind. The unique green camo G-10 handle shape helps elevates the fingers above the cutting edge for comfortable use. The addition of the pinky ring, allows for a variety of draw or grip options. Included is a hand made leather neck sheath with the blade held securely in place by rare earth magnets. Antique Ivory micarta handle for a comfortable and secure grip. Easy carry with the included deluxe leather sheath. Manufacturer's Warning: Caution: Do NOT wear with a pacemaker.